I have done parchment embossing in the past and so I am well aware of how long it takes to create a design. In fact it can take quite a few hours to trace and emboss a pattern. So when we were contacted by Phil who designed the Pollyanna’s Embossing Mat, I knew I had to give it a try. What I like about it was that it was made for the Brother Scan n Cut (and apparently other cutting machines) and what this means is that the time taken to trace and emboss would be reduced dramatically. So we purchased the mat and since we would be reviewing it he kindly included the embossing tool and some parchment paper. We were excited when it arrived and couldn’t wait to put it through it’s paces. We tried different Draw Pressures in the Scan n Cut from 0 through to 6 and all worked quite well. The pressure you use will depend on the effect you want to achieve. We like the idea of the embossing tool that Phil has also designed, as it fits neatly into the drawing pen holder, making it super simple to set up. You can also use your own embossing tool with the Universal Pen Holder. Simply select your design and run the embossing mat with the parchment paper attached (with masking tape), through the ScanNCut. The first run through will trace the design onto the parchment paper. You can unload the mat and remove the parchment paper if you want to do your own embossing at this point. However, if like me, you prefer to let the ScanNCut do the embossing as well, then simply leave the mat in the machine after the first run and let the machine do a second run to deepen the effect. DO NOT remove the mat between the drawings. The ScanNCut will draw perfectly over the first tracing to give you the embossed effect that you are looking for. Experiment with the draw pressures to get the effect you are looking for. I had so much fun playing with this. Overall, we are really delighted with Pollyanna’s Embossing Mat. We know Brother have just released their own embossing kit but after seeing the long winded process that is needed to emboss with their kit, I have to say that the Pollyanna is a far simpler method. 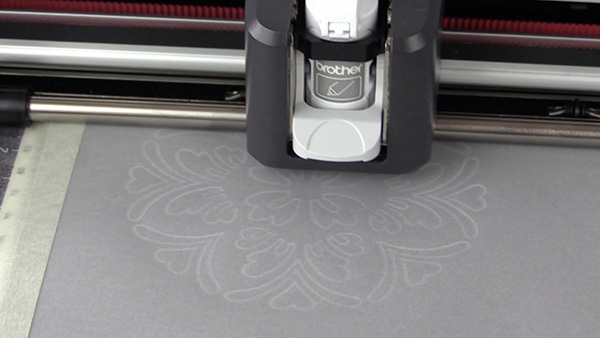 I must also say though that the Brother Embossing Kit can also be used on thin metal. 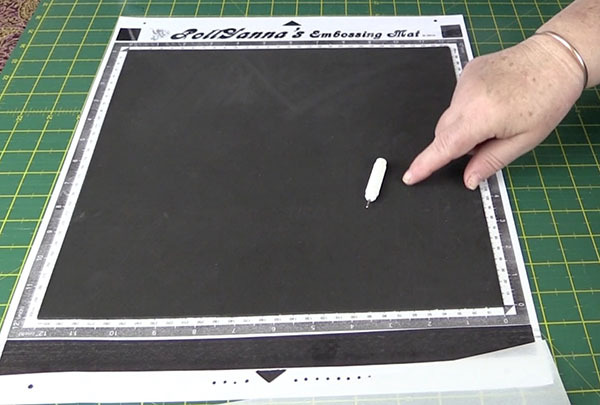 But if you are looking for a mat that will quickly and easily save you hours when embossing parchment, then we recommend the Pollyanna’s Embossing Mat. WHERE CAN YOU PURCHASE THE EMBOSSING MAT? He has added new products to his line including a Card Embossing Tool. Just released their is correct. Of course it is Mary, thank you for pointing it out. It is fixed now. Yes Diane, it most certainly can be used with any ScanNCut machine. 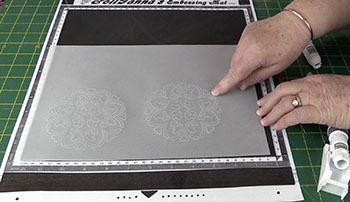 Pollyanna Embossing mats were actually designed by Phil in the Uk and he supplies them worldwide. I hope you love it as much as we do. This looks like fun! Phil is out of stock now, hopefully he’ll get some more in soon. I see there are 2 nibs, one for parchment & one for card stock. Am I reading this right? He has a few design pkgs, hope more will be forthcoming. Use dies or the SNC itself to cut out the embossed design? Yes that is right Ingrid, there are two different nibs, one for yardstick and one for embossing. You can use either dies or the ScanNCut to cut out the embossed image.